Last week, I had the privilege to go out. The first time, I picked up our new house helpers at the NAIA T3 airport via commute. Read: no taxi. I will post details for another post. On our way home, I bought my first Collection Cosmetics lasting lipstick in Sugar Plum (right). The second chance was after we attended a birthday party last Saturday. Instead of allowing ourselves be stuck in heavy and long traffic due to the heavy rains, we headed to Trinoma, where the greenlight sale was happening. I was brainwashed that the Collection Cosmetics lasting lipstick in Mango Tango (left) suits me better than the first one I bought so it went to our basket. 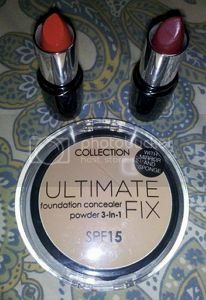 Then the 3-1 foundation concealer powder of Collection Cosmetics went in too because it was so hard to resist something that is very easy to use yet gives outstanding performance! Yeah, take that from me, who’s not so fond of putting too many stuff on my face. I will try to make a face-of-the-day (FOTD) post for you to see what I mean. Thanks to my dear hubby for buying these stuff for me.